It is a rule universally acknowledged that a cop who has some crime in their past will come up against that crime sometime in their work. What drives Sweet Little Lies is that Cat Kinsella is determined to hide her connection to the crime as it involves her father. But this is more than just protecting him, it is sorting through her own behaviour as the new crime shines a light on the grudge that she has been holding against him since she was eight. 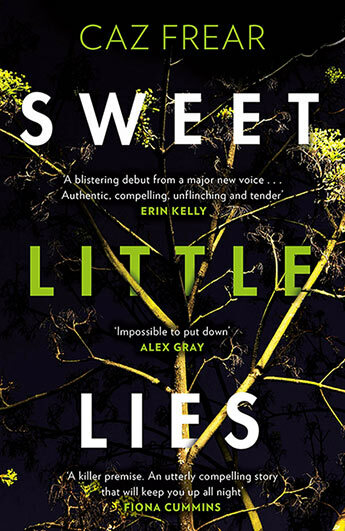 Putting the family connections aside, Sweet Little Lies is first and foremost a police procedural. A woman has been murdered and her body dumped in a local park. Cat Kinsella is one of the detectives charged with solving that crime. Caz Frear gives readers an effective and likeable police team, including Cat’s tough boss and role model DCI Kate Steele and her father-substitute partner Parnell. And as in any good procedural, the case has plenty of dead ends, lucky breaks and lying witnesses. Things only become difficult when a connection is made to another crime that happened many years before, one that Cat has been sure for all these years that her father was involved in. Cat Kinsella is an engaging narrator. Frear manages to put across Cat’s high level of competence despite her personal life falling apart and her growing suspicion that her father is involved. Cat’s complicated relationship with her older sister and brother, neither of whom know anything about what drives Cat’s relationship with their father, is also well observed. The manuscript for this book won debut author Caz Frear something called the WH Smith “Search for a Bestseller” competition. There is plenty of contrivance here which you might expect from a page turner. But Frear has a solid basis to build from both in terms of plot and character and brings the whole together in a satisfying way. The mystery itself is complex and cleverly put together as is Cat’s connection to it. This one may well become a bestseller but even if not, it will be interesting to see what happens if Frear brings Cat Kinsella and her team back.